Welcome. My name is Noah. I am a young and passionate programmer. My day always seems to revolve around technology until one moment when I was introduced into Robotics, then the world was flipped upside down. I made the robots and computer systems revolve around me. Even to this day I still engage with my roots that set me on this amazing path of robots and programming inspired by FIRST. A lot of what I know now has sprouted from the first day I joined a robotics team. Ever since then I have made discoveries into other languages for computer programming and learned everything my self by reading documentation from sources like PHP Docs, Go Docs, RFC, Java Docs, W3School, YouTube (Assorted Users and Seminars), and other peers and people that I have communicated with online via Discord. In my spare time I take my time looking at new Ideas as well as coming up with new ways to use technology while not breaking what the main use case it was designed for. I also mess with Open Source software and operating systems such as FreeNAS, PFSense and Citrix XenServer. At Green Tech I am responsible for taking phone calls and resolving problems via phone as well as connecting to their machine, and handling tickets created by users as well as walk in jobs such as Upgrading a machine and migrating data. Also my role was to go on site to install or repair machines and do updates to the machine that are unable to be completed remotely (IE: BIOS Updates, Hardware Upgrades). Noah works with the owner to program miscellaneous packages for a few different languages that the Customers use to interact with the Main API Endpoints and the GitOdin Socket Servers. Noah also handle the versioning side of the code, as well as keeps that code update to date so it is always working with the new and updated API. At Sea Hag Pearls I work with members of the team in house and remote to bring hosts online to sell an assortment of items, my role is to make sure the viewers and the other dependent systems do not go offline at unexpected times during the show or business operating hours. We currently use Digital Ocean where we host a machine to duplicate/mirror the video feed to multiple video sources found on Facebook and YouTube. I also manage the online balancing of the money within the bank account and the online transaction system for payment processing using our online store. At SJ Robotics Noah manages the Communications between teams and other organizations to help make a more uniform system across all FIRST Robotics teams that are partnered with SJR. At FTC (Families to College) I teach high school kids how to program in a selected language, selected at the beginning of the course, in this case Java was selected. The kids are learning java as well as git CLI, with linux. The kids are also learning how to take the skills they learn in this course to program a robot to do a basic task. At PushThis Noah worked with the owner and another developer to help bring a vision of how people would use their API to a real PHP package. Noah has made a package that would interact with the HTTP API and properly handle the situations that may occur. Latter the Company Closed and Reopened as GitOdin with a new system. My role on the team is to work with people and introduce them (if they are new) to the tools that we have, show them around the shop, show them the procedures that we have in place for safety and security or themselves and the peer around them. I also am the team programmer where I program in Either LabVIEW or Java (C++ is another language but I have not taken the leap yet. ), I did start in LabVIEW but I did transition to Java as it is more common in StackOverflow and Robotics as well as it has more libraries. On this team I was the Team Leader which was making sure the team was on the right path or was at least always making an effort to be on top. As the programmer I worked with a person from the Navy, he worked for Novell-Micro Focus as a Dedicated Support Engineer, together we worked to program a robot in the RobotC software that was a IDE to program in the C language. Most of my projects are filed as The Unlicense or MIT Licesnse. Webhook Cooridinator - This is a PHP library for interacting with Slack and Discord webhook APIs as well leaving it open for others to build their own webhook Event and use this package. Inventory System for JP Diagnostics - A Private Project for a business that wants a system to manage inventory stock as well as keeping track of purchase orders. HowTo4IT - Another Person and myself are working together to make a system to manage Articles or How Tos' for companies and provide security. So this system manages instructions for the top most security essential systems and provides one unified system to operate it all in. Product and Ordering System - This system is for my School. It will keep stock of the items and allow for clients to do ordering as well as have a monitor display for orders in processing as well as a chat system incorporated into it for live communications. Scratch Card System - This is a personal project that I have that I am used in SHP (Sea Hag Pearls) for customers to buy but it was not good enough so I have taken the project down to improve and make it better for everyone. Any courses that I have taken or programs that I have enrolled in that have verified me in anything would be entered here. Hurricane Electric IPv6 Certification - Hurricane Electric Free IPv6 Tunnel Broker. The Hurricane Electric IPv6 certification service enables you test your IPv6 skills. Every day users take certification tests and improve their knowledge of IPv6 and increase their score and level. 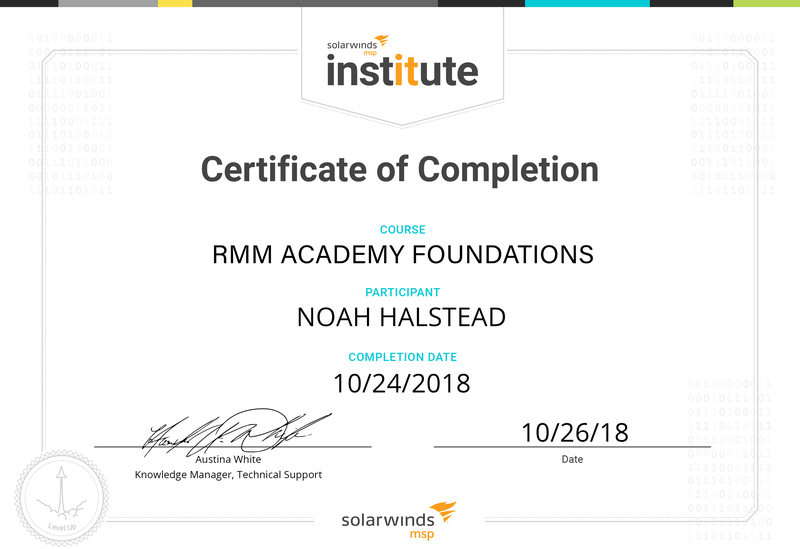 Solarwinds MSP, RMM Academy Foundations - Become a SolarWinds® Remote Monitoring & Management (SolarWinds RMM) Certified Specialist. Remote Management Foundations is an introductory training session for the RMM platform. Learn how to navigate the Dashboard, deploy agents, and configure features with ease. Granted this is a Cert of Completion, I use RMM at my current job, Green Tech, to manage all of our client devices from Back up and Restore to AV Defender for Anti-Virus. 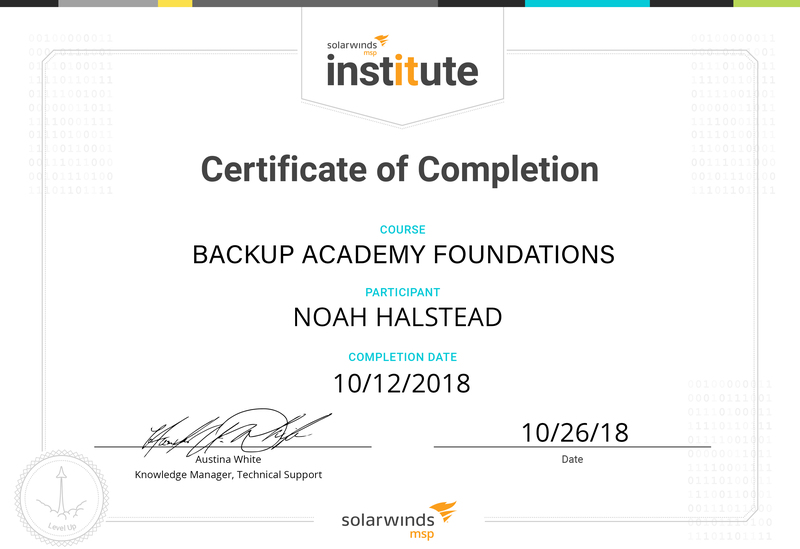 Solarwinds MSP Backup, Backup Academy Foundations - Become a SolarWinds® Backup and Recovery Certified Specialist. The training consists of two x 1 hour modules where you will learn how to operate and manage Backup and Recovery. IT Glue - IT Glue™ is award-winning IT documentation software designed to help you maximize the efficiency, transparency and consistency of your team. Explore IT Glue and you'll find everything you need to streamline the creation and up-keep of IT documentation. youmightnotneedjquery.com - Good place to find some code in JS that does the same in jQuery. Bootstrap - Very Easy way to design a website and simple to use across all platforms and frameworks. CodeAnywhere - Atom.IO like Code Editor but All online. It has SFTP and SSH connections as well as FTP + 1 Free Container to work on your code. Lets Encrypt - Free and Secure SSL Certificates that can be used to secure your own website with little to no work needed to make it work.